Mon., Oct. 2, 2017, 1:43 p.m. ENDANGERED SPECIES -- DNA tests have confirmed that a wolf captured, tested and fixed with a GPS collar on June 8 is indeed a wolf. The U.S. 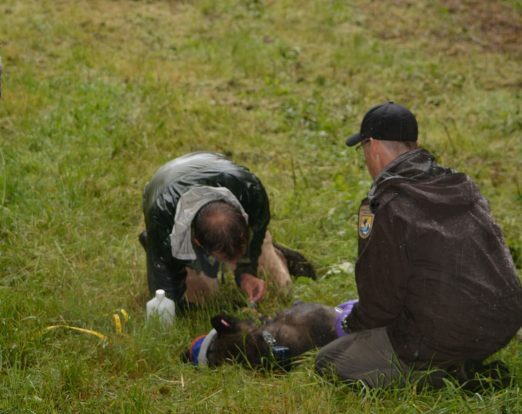 Fish and Wildlife Service says a GPS collar placed on the wolf captured in June shows the 100-pound black male has remained in Skagit County. It's one of the few wolves known to have set up operations on the west side of the Cascade mountains in northwestern Washington. It’s not clear where the gray wolf came from because DNA samples don’t find a connection with known wolf packs in Eastern Washington, Idaho or British Columbia, says Fish and Wildlife spokeswoman Ann Froschauer. The federal agency lists the wolf as an endangered species in the western two-thirds of Washington and has jurisdiction over the species there. In the eastern third of the state, wolves are protected by state endangered species rules and are managed by the Washington Department of Fish and Wildlife. Officials say the Skagit wolf is hanging around the Marblemount area about 100 miles from the nearest known wolf pack and that it has not been associated in conflicts with domestic animals. Wolves have been documented in Northwestern Washington off and on since 2011 and a wolf was killed by a truck on I-90 in 2015. The highest concentration of wolves in Washington is in the northeastern quarter of the state.